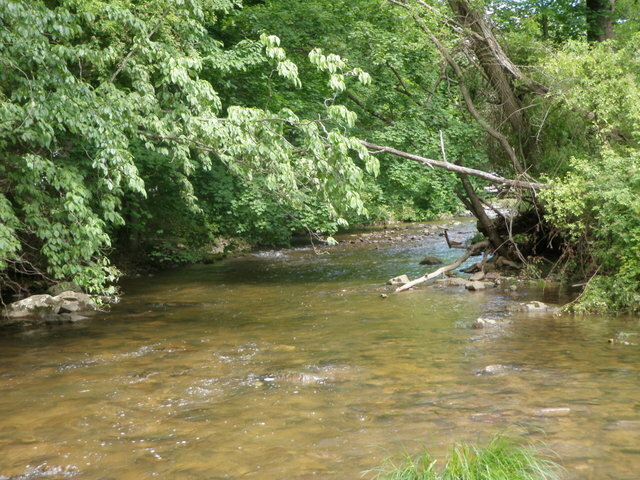 Normally in June I am anxiously checking the stream flows for signs that the water is dropping and perhaps I can fish on a stream by July Fourth. 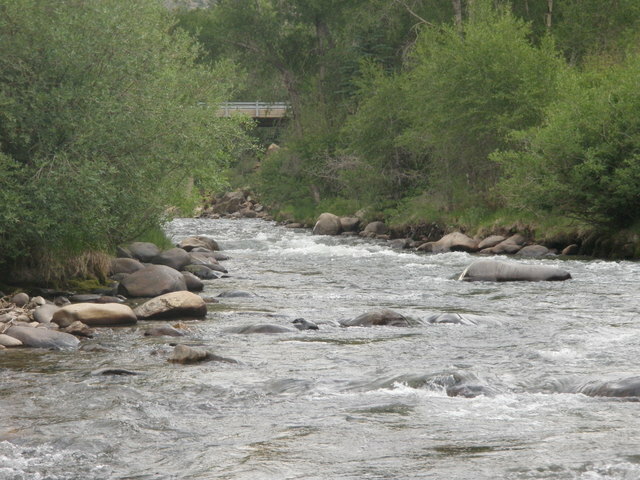 I need to keep reminding myself that it is only June as the air temperatures and the lack of snow pack make the rivers and streams of Colorado look like it is late July or even August. Starting on Friday June 22 through June 26 Denver experienced five successive days with high temperatures over 100 degrees. With this backdrop Dan and I decided at the last minute on Sunday to make a trip to Clear Creek for an evening of fishing. 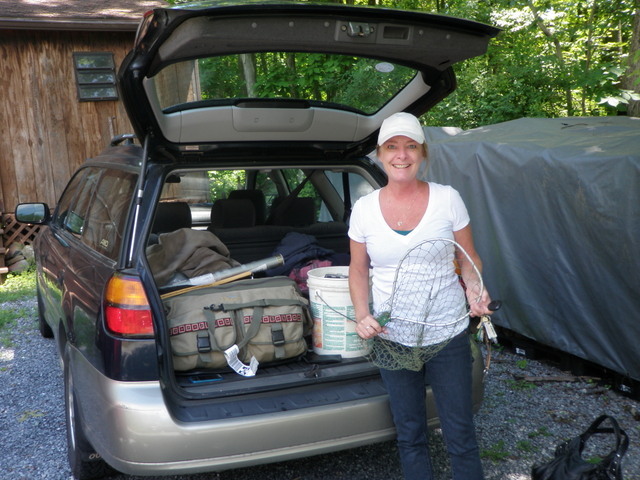 I picked Dan up at 4PM and we were parked and ready to fish on Clear Creek by 5PM. The eastbound traffic on interstate 70 looked ridiculous so I hoped it would clear by the time we elected to make the return trip. Because of the heat, Dan chose to wade wet with shorts and chacos. We soon discovered that some entrepreneurs purchased land just east of the open space and opened a zip line business. There were at least six wooden towers; three on each side of Clear Creek with wires connecting each tower. We also noticed there were no trespassing signs on all the towers, so we walked beyond the eastern boundary and descended the bank to a stretch where we began fishing in previous years. Dan began fishing with a Chernobyl ant and waded to the north side while I tied on a lime green trude and fished the half of the stream closest to the road. Fairly quickly I had a refusal and then a couple momentary hook ups on the trude. Dan meanwhile wasn’t having much action. I moved upstream a bit and finally connected on a couple small browns. Dan moved up along the right bank roughly parallel to my position. 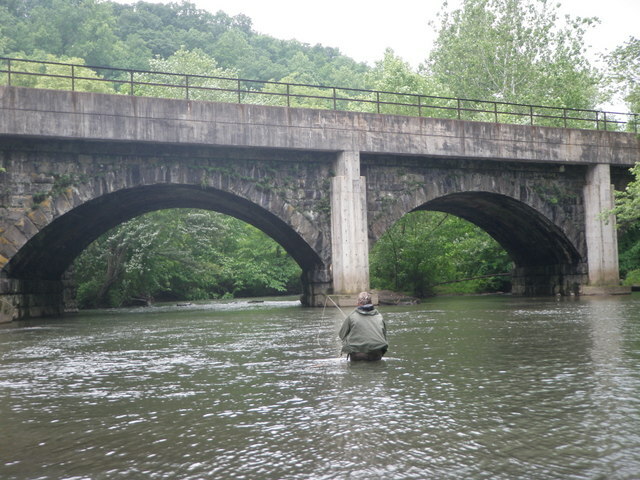 After I landed a third brown on the trude from beneath an overhanging branch along the bank, I noticed that I was getting close to the first wooden tower, and I wasn’t sure if I was in private water. A man with a red shirt was gathering trash bags at the base of the tower, and eventually he began walking toward me. This could only mean one thing, I’d crossed the line. I made a hasty retreat back downstream to near the area where we’d begun, however, Dan couldn’t move as fast because wading in chacos requires careful foot placement. When Dan and I met near our starting point, I asked him what the gentleman said, and Dan said he couldn’t hear over the rushing water, but he was motioning with his thumb to get out. 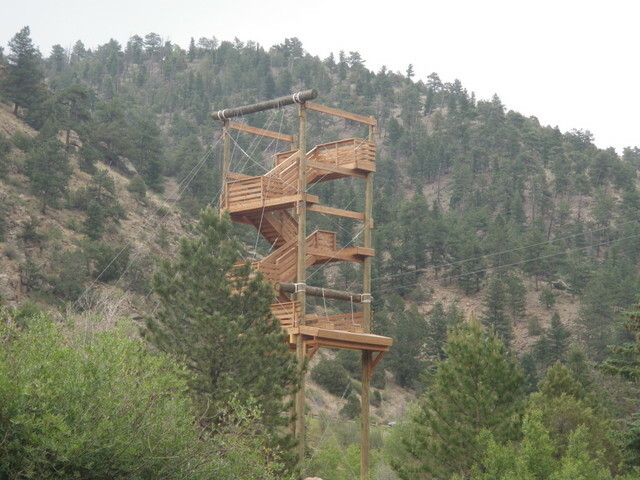 We ascended the bank and walked back up the frontage road to a spot just beyond the western border of the zip line property where we dropped back down to the creek. This time Dan stayed on the south bank closest to the road, and I waded across to fish along the north side. By now Dan had switched to a lime green trude and it wasn’t long before he shouted, and I looked toward him and saw an eleven inch brown trout doing cartwheels as Dan had set the hook pretty hard. He wasn’t about to lose this one. I waded toward hiim and snapped a decent photo then returned to the business of fishing. 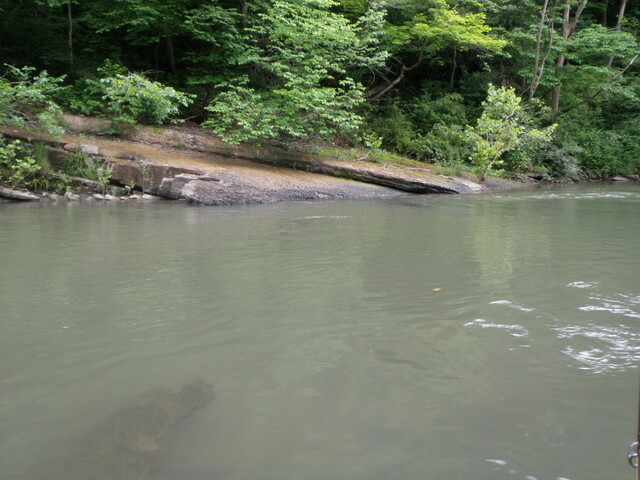 After I moved upstream a bit I reached a ten foot stretch of water where only around two feet of slack water existed between the current and the bank that could hold fish. I flicked a few backhand casts upstream and the current pulled my fly right along the grassy bank. On the third or fourth such drift a brown emerged from the bank and slurped the trude. As I continued upstream II felt like there were more fish than we were pounding to the surface so I tied on a Chernobyl ant and dropped a beadhead hares ear off the bend. I was mostly using the large foam attractor as an indicator and hoped to get some action on the nymph as I approached the bridge. I fished up to the bridge and then waded underneath and up along the bank on the opposite side. I’d seen kids swimming in this area and didn’t hold much hope so I covered this water fairly quickly and then came to some additional bank side pocket water forty yards above the bridge. Here in a short but deep hole in front of a large rock a 10-12 inch brown emerged from the depths and sipped in the Chernobyl ant. This occurred no more than five feet across from me and was quite cool to observe. Dan was having difficulty seeing his trude in the bright glare on his side of the river, so I suggested that after I covered two more attractive spots upstream, that we should call it a night and return to the car. Dan found a spot where he could ford the creek while I fished out the stretch of pockets, and then we scrambled over the large boulders along the stream and reached the car by 7:30PM. We had escaped the heat, landed a few fish, and had additional action in the form of momentary hook ups and refusals so we decided to celebrate and wait out the traffic some more by stopping at Tommyknocker’s Brew Pub in Idaho Springs for dinner. The two fish tacos I consumed rank among the best I’ve ever had and the Black Powder Milk Stout only added to my enjoyment. It was a grand early summer evening in Colorado. On Saturday of Fathers’ Day weekend Dan, Jane and I had great fun as we took two separate mountain bike rides, enjoyed lunch in Westcliffe while watching a storm develop, hiked the Rainbow Trail south from our campground, and fed the donkeys and horse that occupied the pasture by the entrance to the campground. Jane prepared a great meal of Thai green curry for Saturday evening, and Dan constructed another great fire in the pit at our campsite. The plan for Sunday was to have a hearty breakfast and then break camp. 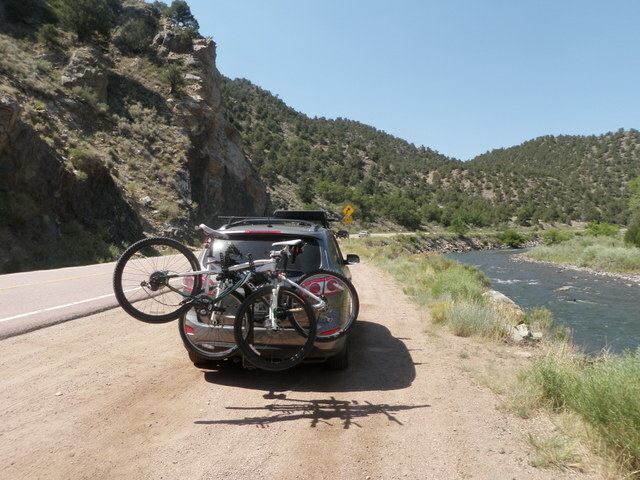 Jane would drive the Santa Fe back to Denver while I transferred my fishing gear to Dan’s car so we could fish on the Arkansas River again. I decided to revisit the same area where I’d had success on Friday, as I felt it offered the best hope for Dan to have a great day as the braided area spread the flows out and the weather was forecast to be in the mid to upper 90’s again. 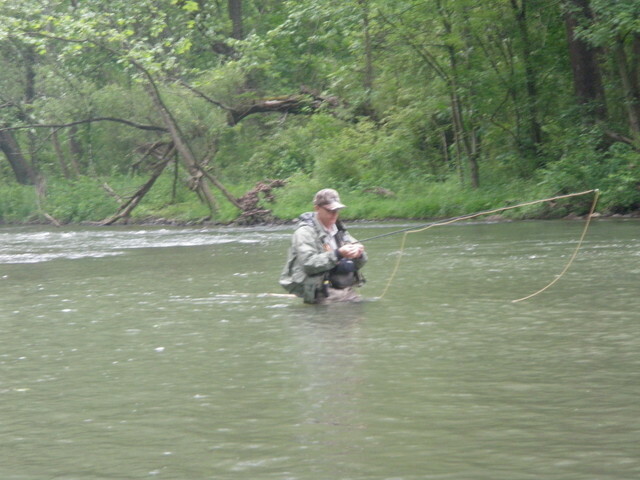 Dan was using his new Beulah fly rod for the first time so he was anxious to test it out. Sunday was another very hot day as high temperatures climbed to the mid-90’s, and we started fishing around 11AM just as the sun climbed toward its peak in the clear blue sky. We parked across from the spot where the river divides into three channels and waded across the first two to reach the bottom of the north branch. I gave Dan two lime green trudes, one size 16 and one size 12, and he began fishing up along the right side while I took the left. I started with a gray parachute hopper with a beadhead pheasant tail dropper. It didn’t take long before I experienced a refusal to the hopper and then a brief momentary hook up with the pheasant tail. 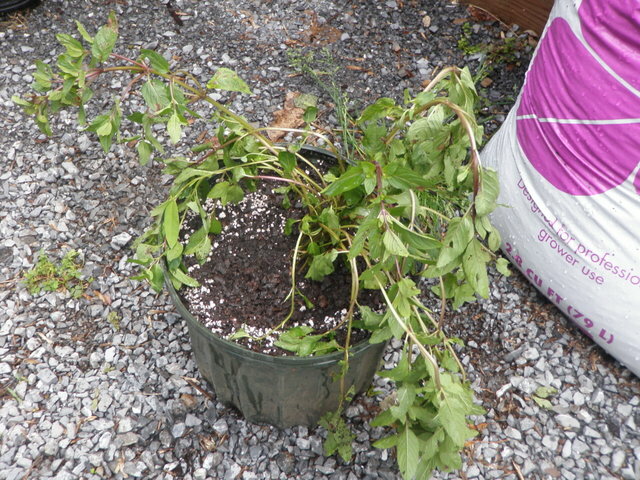 My optimism proved to be premature, as I went through a dry spell. Meanwhile Dan was getting some action with his lime green trude, so I switched over to the same fly. Eventually I landed a fish or two on the lime green trude before we broke for lunch at 12:30. By lunch we had fished the length of the north braid from its confluence with the main Arkansas up to the point where another short channel joined. After lunch I suggested we continue on the north braid from the point where the short channel joined to the point where the flow split off from the main river. This stretch contained some faster water with more pockets. I felt that this water would be more oxygenated and the faster riffled current would make it easier to approach fish in the hot afternoon with virtually no cloud cover. The green trude ceased to produce as it had earlier, and I really wanted to work nymphs through the short pockets so I tied on a buoyant Chernobyl ant and added a long leader section of three feet with a beadhead hares ear on the point. I mentioned to Dan that I hadn’t fished the beadhead hares ear as much early in the season as I had in previous years and concluded I was overanalyzing. Dan on the other hand had been fishing a beadhead hares ear since near the start and had landed his two fish on it. Shortly after making the switch I landed a decent brown that smashed the nymph. In another short pocket I spotted a brown as it flashed up to look at but reject the Chernobyl ant. Two drifts later the same fish snatched the BHHE as it moved through the tail of the pocket. After releasing the fish I lobbed another cast to the top of the pocket and let it drift along the current seam and noticed another flash toward the Chernobyl. Once again on a subsequent drift I hooked but then lost the same fish. The best action of the day would take place in the hour after lunch in twenty yards of pocket water between the junction of the small braid and part way to the main river. I landed an additional four browns in the 10-12 inch range on the beadhead hares ear. The remaining thirty yards of water were narrower and offered fewer prime holding locations. I covered this water fairly quickly with no luck and reached the junction with the main river. There were some nice deep pockets here, but I couldn’t entice any fish to grab either of my flies. Dan was forced to move to the bank I had just fished because the water was quite fast and tight to the north shore.with thick shrubs reaching out over the water. When Dan caught up to me it was approaching 4PM, and we were both extremely hot and tired and thirsty so we waded downstream along the edge of the larger channel to a point across from a small bridge. We were able to cross over here and walk the short distance back to the car. Our day ended with eight total fish landed, six by Dave and two by Dan. We both enjoyed breaking in our new rods and felt that we were fortunate to catch what we did under vary difficult conditions of clear skies, high sun, and warm air temperatures. 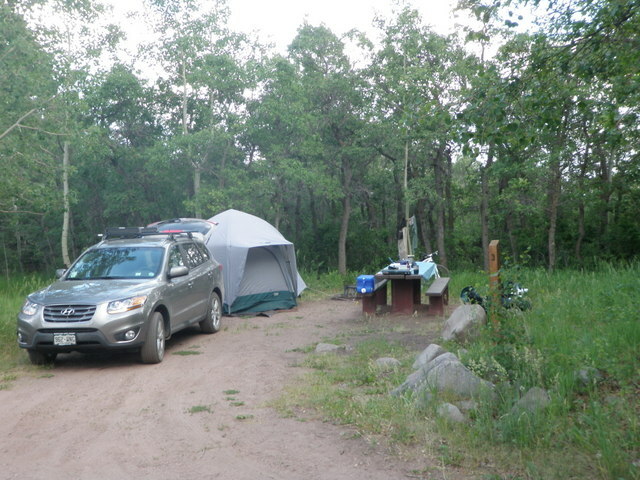 Last year in July Jane and I stumbled into a great campground in Colorado called Alvarado Campground. Alvarado is in the Wet Mountain region of Colorado west of Pueblo and east of the Sangro de Cristo range. We had often read of Westcliffe, the small town at the center of the region, and hoped to visit some day. Last summer the run off extended to late July so I was willing to camp in this area even though there were limited fishing opportunities as just about all rivers and streams were high and unfishable. 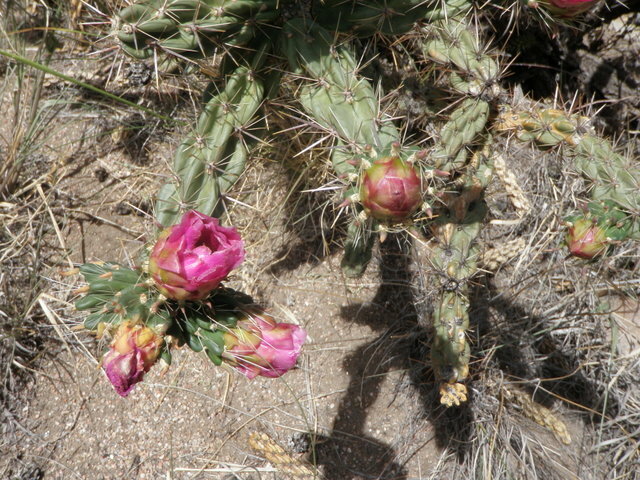 We actually planned to camp at Lake Creek Campground, a smaller place closer to Canon City, but when I reached the turn off there was a large sign saying the campground was closed due to a wildfire. I switched to plan B and drove further south to Alvarado. We enjoyed a great weekend hiking and biking the Rainbow Trail and browsing the shops in Westcliffe on Sunday morning. Fast foward to 2012 and I had it in my head that I wanted to return to Alvarado in June during runoff to enjoy mountain biking on the Rainbow Trail. I went the the National Forest Service web site to reserve a campsite for Fathers’ Day weekend and discovered that the campground was closed until June 29 to allow time to clean up massive quantities of blown down trees from the week of extremely high winds. This forced me to make a 180 degree reversal, and we targeted Lake Creek, our original July 2011 target destination. Lake Creek, however, does not take reservations and only contains twelve campsites. I planned to not work on Friday, load the Santa Fe with all the camping gear, food and bicycles and travel to Lake Creek and secure a campsite early before the after work hordes arrived. Jane and Dan would then leave Denver after work and join me on Friday evening. As it turns out, the runoff on Colorado rivers in 2012 is minimal and the Arkansas River flows are at levels usually seen in September, so I planned to stop and fish on my way to snagging a campsite. I loaded the car and was able to depart our house in Denver by roughly 8:30AM. 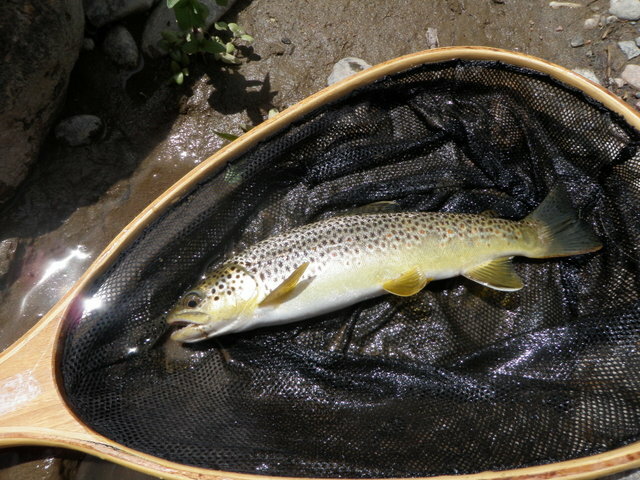 Traffic was heavy in several locations, but I was on the stream fishing by roughly 11:30. I chose the large pullout just up the river from Pinnacle Rock access area where the main river divides into multiple channels, and I enjoy the smaller stream conditions this creates. 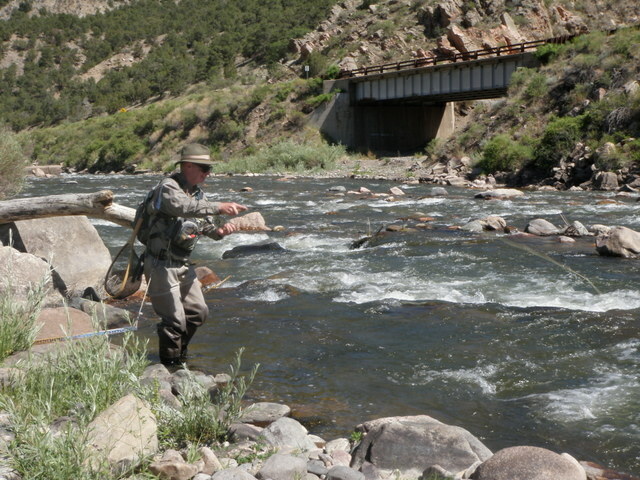 After putting on my waders and rigging my new four weight rod, I hiked down route 50 to a stretch with a high cliff where the river churned through a narrow chute. I tied on a yellow Letort hopper and dangled a beadhead hares ear and began working the narrow pockets tight to the bank. I covered quite a bit of water with no action so I began switching the dropper until I tied on a copper john. Taylor Edrington had mentioned that a copper john imitates the nymph of a yellow sally. 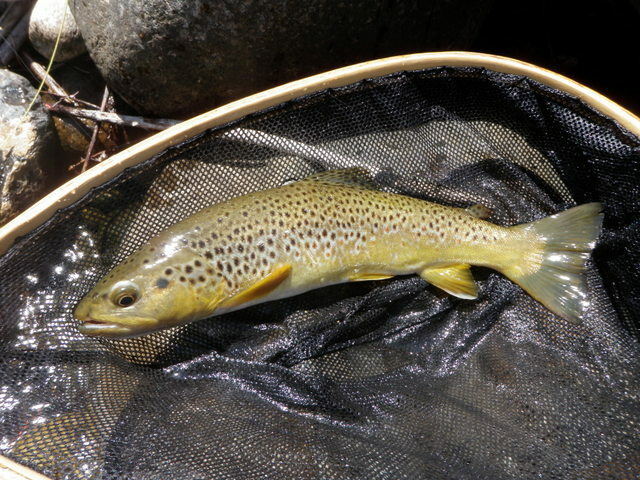 This did the trick and as my top fly drifted tight to a large rock that jutted into a nice deep run, the hopper dipped and I set the hook and played a nice twelve inch brown trout. 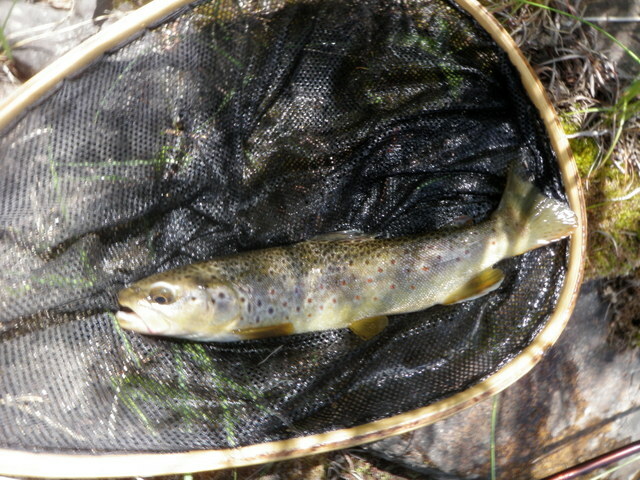 It was a nice test of my new rod, and I was pleased with the lightness of the rod along with the fish handling capacity. 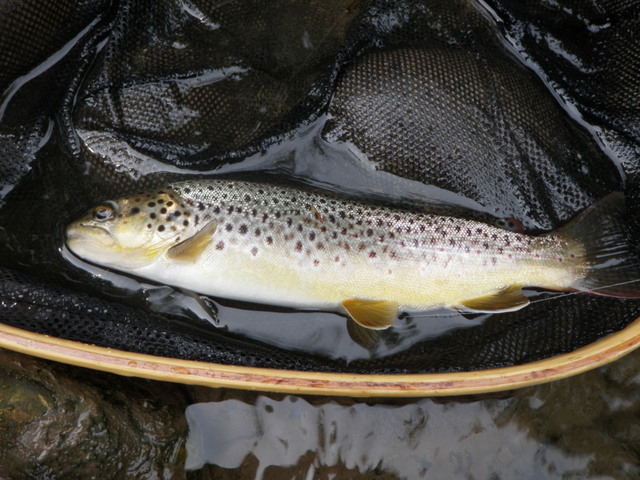 I moved on and landed one additional smaller brown before arriving across from my car at around 12:30PM. I ate my lunch by the river and carefully observed but didn’t see much insect activity on the water. I decided to walk up the highway after lunch and cross to the northern most channel of the river. This is one of my favorite stretches of water on the Arkansas. 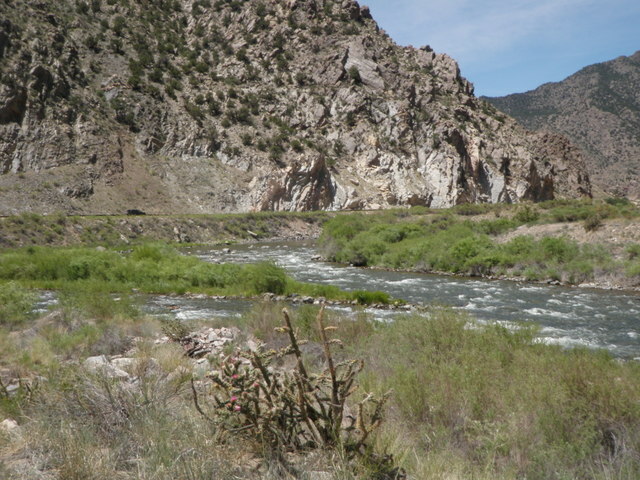 I crossed the two channels closest to the road and circled around the junction of channel three with the main stem and began prospecting the juicy riffles of moderate depth that characterize this area. Initially the hopper dropper was not producing and I covered quite a bit of nice water that is usually very productive. In the next attractive stretch I observed several refusals to the hopper and then landed a pair of foul hooked fish. 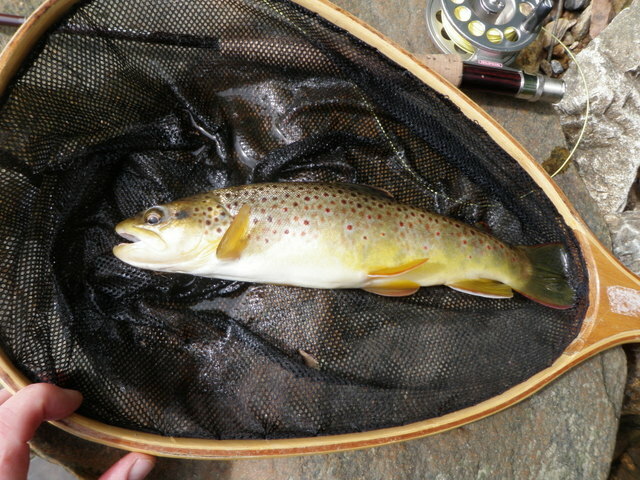 I saw the fish rise toward the hopper and turn away, but set the hook anyway and foul hooked the browns with the trailing nymph. After the second foul hook incident I paused to analyze what was going on. 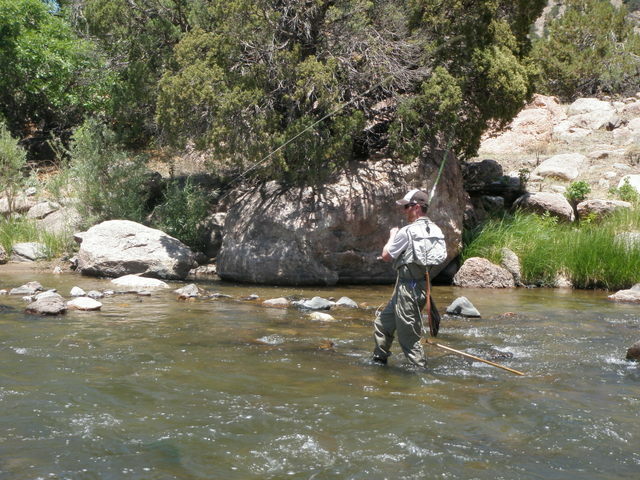 The Royal Gorge Angler web site suggested fishing yellow flies in the size 16 range in the afternoon in the current seams. My fly had the correct color but the wrong size so I theorized I should downsize. I pulled a size 16 lime green trude from my patch and converted to a single dry fly approach. In short order a decent brown sipped in the lime green trude at the tail of a riffle right above me. 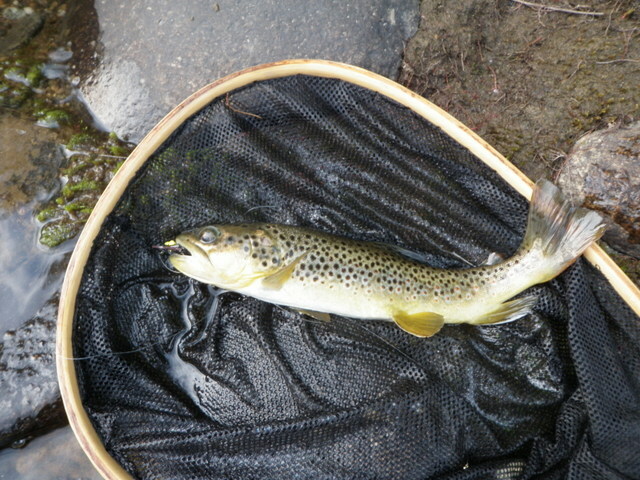 Very quickly two more browns slurped the frauds, but then in the next stretch of pockets I observed multiple refusals. Now my mind began to analyze again. Perhaps my fly was a bit too green? I had some size 16 yellow sallies in my patch so I tied one on and drifted over the area where the last refusal had taken place. No luck. I spotted a solitary mayfly take flight off the water that may have been a PMD. Could they be tuned in to a sparse PMD hatch? I tried the money fly, but this elicited nothing. At least the lime green trude caught a few fish and grabbed their attention, so I reverted, but this time tied on a size 14 or 12 fly. This fly was much easier to follow in the riffles and glare, and much to my amazement, it began to produce fish. I landed a decent brown and over the remainder of the afternoon up until 3PM I added two more to bring my count to eight on the day. I continued to get refusals to the larger trude, but It seemed to be most successful on drifts where I cast across and let the fly drift down to the tail of a riffle or run. It was a fun day, and I felt quite proud to have landed eight fish in 90 degree heat with minimal cloud cover. 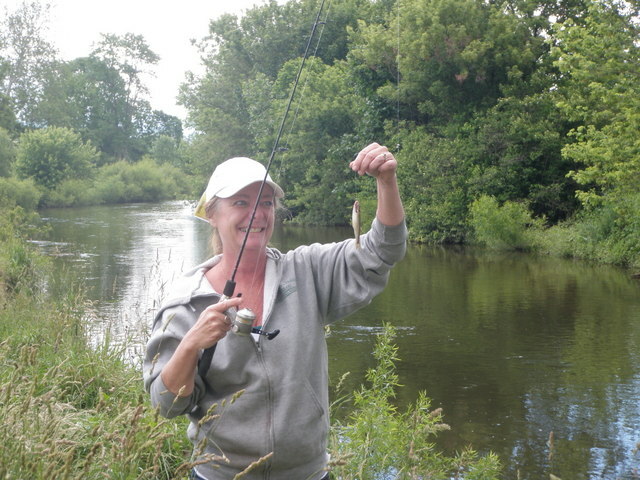 I also felt the satisfaction of casting my new lighter four weight rod and feel the throb of some fish. After calling it quits I drove another 20 miles or so to the Lake Creek Campground where I snagged one of the three remaining campsites. I cracked open a beer and ate some snacks and read a fly fishing magazine while waiting for Dan and Jane to arrive with dinner. They arrived as expected around 7:30, and after gobbling a grilled ham sandwich with potato chips, I helped Dan gather firewood. We thought there was a fire ban, but several fires were already crackling at other campsites, so we joined the fun. 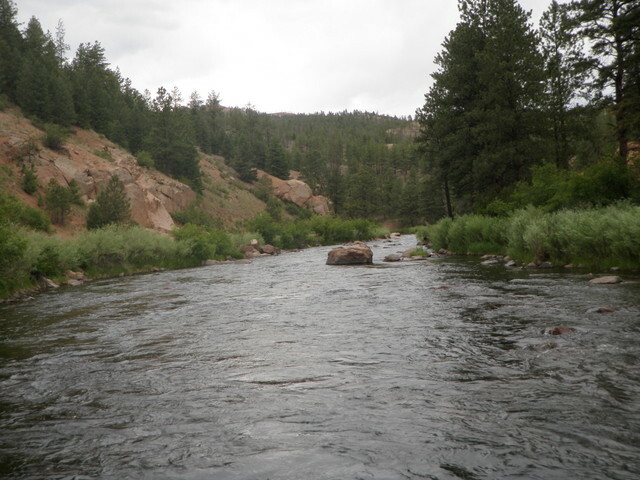 The days were approaching their longest length, and I had a new fly rod begging to be tested so I packed all my fishing gear in the Santa Fe on Tuesday morning and planned to drive directly from work to the South Platte River in the Deckers area. The plan worked reasonably well and I arrived at the first parking lot on the dirt road that heads straight from Deckers and was ready to fish by 5PM. Some large dark clouds appeared in the western sky and it seemed much later in the evening than it actually was. I walked down the dirt road a good distance until I was just above the large pool by the bridge at Deckers. Another fisherman was on the opposite shore at the top of the pool, so I decided to drop down to the river fifty yards above him, even though I was on the opposite bank. 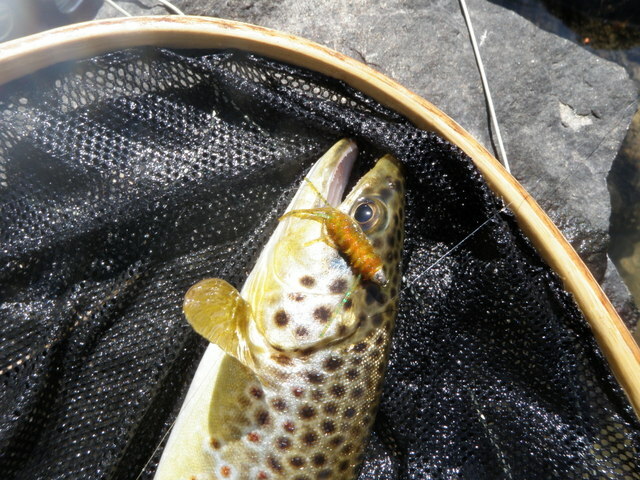 I began fishing with an orange scud and bright green caddis pupa on a nymph set up with an indicator and split shot and began covering all the deeper slots and runs for 20 yards or so. Nothing was doing. I switched out the orange scud for a San Juan worm and continued but still no action. 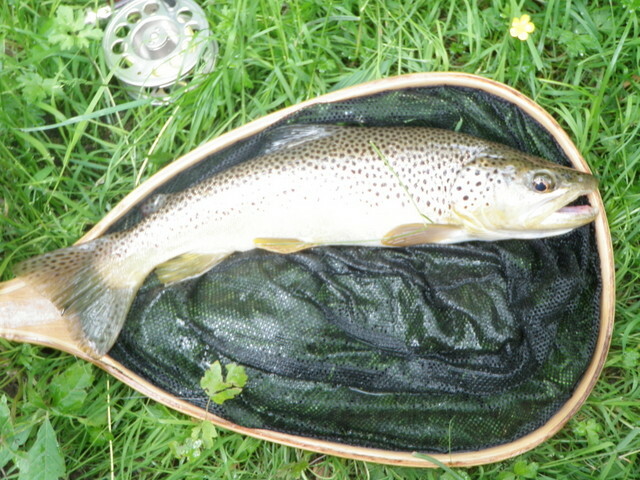 I also tried a beadhead hares ear and beadhead pheasant tail on the nymphing tandem. After covering quite a bit of nice water with no results, I elected to go with a dry/dropper setup as the water wasn’t excessively deep. I began with a yellow Letort hopper and dangled a bright green caddis pupa as well as a beadhead hares ear, but these combinations were equally ineffective. Toward the latter part of the evening, I clipped off the hopper and nymph and went with a muggly caddis and then a light gray deer hair caddis and finally an olive brown deer hair caddis. Frustrated with the lack of success with these dries, I resorted to fishing classic wet fly style. I just read an article in Fly Tyer about situations when wet flies work when nothing else produces. I was in that very situation. I tied on a beadhead bright green caddis as the top fly and an old hares ear wet fly at the point and began cast across and letting the tandem sweep down and across below me. I did this without the aid of a strike indicator, but alas this also proved to be fruitless. I removed the hares ear wet fly and replaced with an olive and black woolly bugger and imparted action, but this also was not effective. My last tactic was to stop and watch the water for any signs of rising fish. This actually worked as I was on a large rock overlooking the river and there were some beautiful slower moving areas opposite me and the main current. I saw two separate rises toward the tail so I tied the caddis back on and placed numerous casts in the area, again to no avail. I decided to flick some casts to a small current that fed the pool and on one of these drifts a fish rose in the small current area. I set the hook thinking it was on my fly, but that was not the case. Either the fish took a real natural next to my fly or I witnessed a refusal. After attempting a few more casts to the area with sporadic rises, I decided to reel in and call it an evening. My feet felt like stumps from standing in the icy tailwater flows. 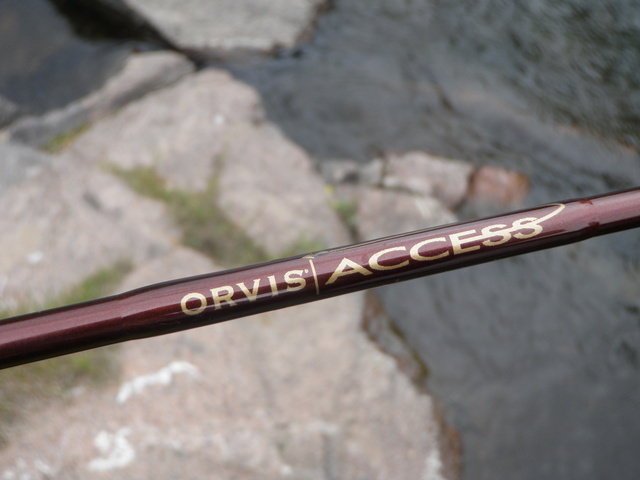 The Orvis Access is light yet stiff and casts quite well, but I still don’t know how it feels to have the weight of fish on the new rod. 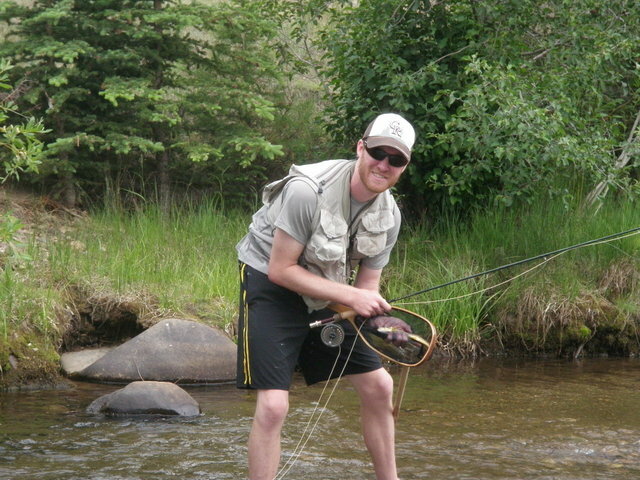 After my return from Pennsylvania I worked on Thursday and Friday, but was itching to do some Colorado fishing. 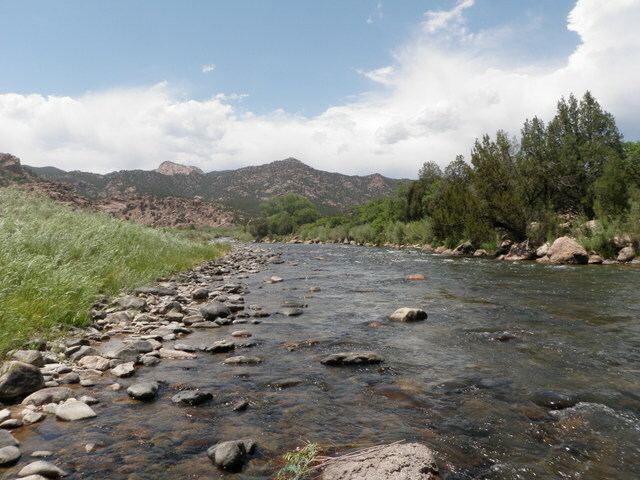 All the reports were indicating that run off was a non-event in 2012, so Jane and I elected to drive to the lower Arkansas River above Canon City on Saturday. I researched some nearby hikes for Jane, and we packed lunches and hit the road at around 8:30AM. It turned out to be quite warm with temperatures in the low 90’s, but we found a nice spot at the Arkansas Headwaters Five Points access area. 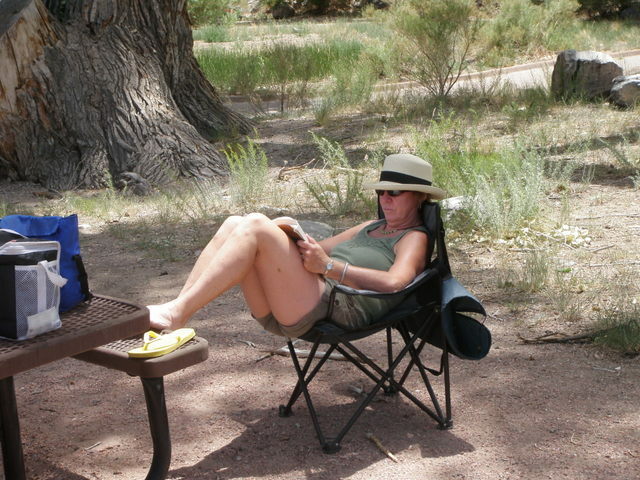 Jane set up her chair under a huge cottonwood tree and propped herself there while she read her Kindle. Meanwhile I put together my Scott 6 weight and prepared to fish the area directly across from Jane’s home base. I began with a yellow Letort hopper trailing a beadhead hares ear, and it didn’t take long before I landed a decent eleven inch brown. As I fished a flotilla of rafts drifted by, but they kept to the middle of the river, and I didn’t feel they were impacting my fishing along the edge. Another small brown inhaled the beadhead hares ear as I worked my way fairly rapidly along the bank hitting all the likely spots that might hold trout. Next a small brown inhaled the yellow Letort hopper and I continued covering the water; however, I was experiencing refusals, and the beadhead hares ear ceased to produce. I decided to swap out the BHHE for a copper john, and sure enough at the base of an island another eleven inch brown gobbled the copper john. The river divided around the long narrow island and the raft traffic took the slightly deeper straight channel to the north. I was quite excited to fish the left channel as it was devoid of raft traffic and looked like it contained some nice pockets and runs. It was 12:30PM or later and I told Jane I’d return for lunch within an hour, so I deferred the left channel and returned to her base camp for lunch. We decided that after lunch she would take the car and search for the Red Canyon Park to hike, and then we planned to meet back at our base camp at 3PM. In retrospect this did not allow enough time to drive to Red Canyon Park which required 20 miles one way, a hike and then another 20 mile return drive. Arkansas rubberlegs and below that a RS2. I flicked the nymphs up into the deep run and on the fifth drift noticed an unusual movement in the indicator, set the hook, and landed a 10 inch rainbow. I continued working up along the bank and up to 25 feet out and landed two more fish before I retired at 3PM. One of the remaining fish gobbled the Arkansas rubberleg along the edge of a current seam and this fish probably was in the 10-11 inch range. The last fish fell for the RS2. Jane was returning to the picnic area just as I walked up, and she told me she spent most of the time driving. Clearly we should have alloted at least another hour to our scheduled meeting time. 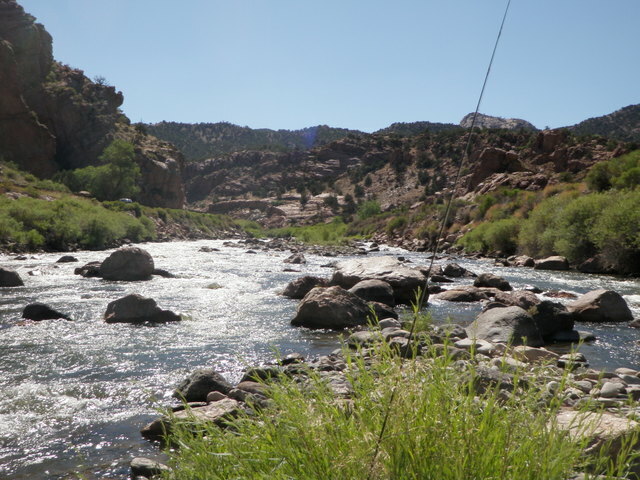 We packed everything back in the car and returned toward Canon City where we stopped at the Royal Gorge Angler where I met Taylor Edrington and asked him a series of questions about our trip to Argentina. I also purchased a new Orvis Access four piece 8’8″ four weight rod for myself and a Beulah four piece 9′ five weight rod for Dan. The Orvis rod is much lighter than my Sage four weight, and I’m quite anxious to test it out.